Knowing that I had to leave my air-conditioned hotel in Salzburg eventually, I slept in this morning: almost until 9 a.m. I begrudgingly pulled myself out of bed and quickly showered and dressed, though, because I wanted to trudge up to Hohensalzburg Fortress before it got too hot in the day. Well, perhaps not trudge: I took the funicular up because it’s included in the price of the ticket and why do extra walking when you don’t have to? When I arrived at the tower, I followed signs to a “photo point” and this is what I saw. If that doesn’t make a person break out into song, I don’t know what will. The fortress sits on a small mountain, so the view is pretty amazing. The fortress itself was pretty cool, too: very medieval and bigger than I expected. 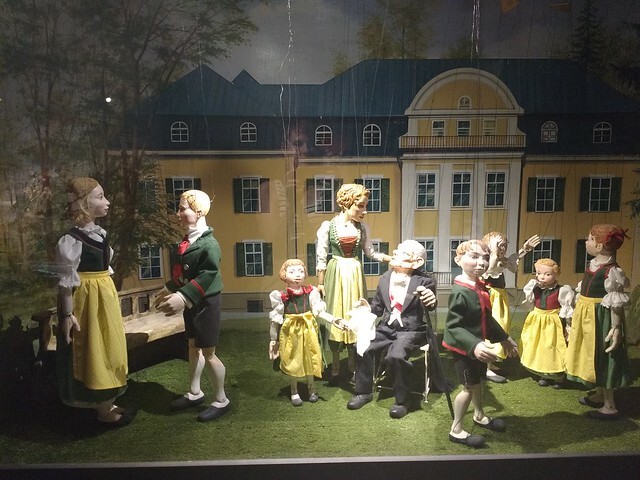 I walked through several exhibits, including the Marionette Museum, which was fascinating. I only wish I’d been there for one of the shows they put on throughout the week. I wandered around, just sort of letting myself get lost. I ended up climbing to the top of one of the towers (on circular stairs that never ended) and across the fortress’ old battlements. I admit that it made me think of Monty Python (your mother is a hamster!). 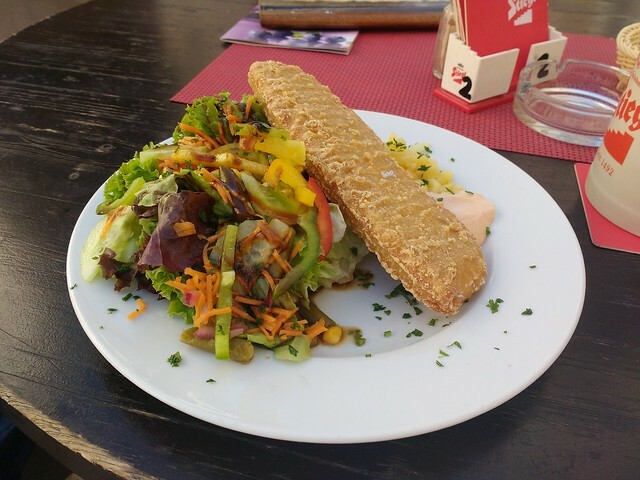 Of course, lunch rolled around rather quickly, so I ordered something that seemed healthy enough: fish with potato salad. Of course, I assumed cod meant grilled cod, but I should know better by now: it was fried. But that’s okay, because it was rather good. And yes! There are leafy greens on there! The first I’ve seen all trip! I ate them and I’m pretty sure it sent my body into shock. I also ordered the Stiegl grapefruit radler that I discovered in Tennessee, of all places, although this was better and straight from the tap. I wandered around the fortress again and then headed down into Salzburg proper. 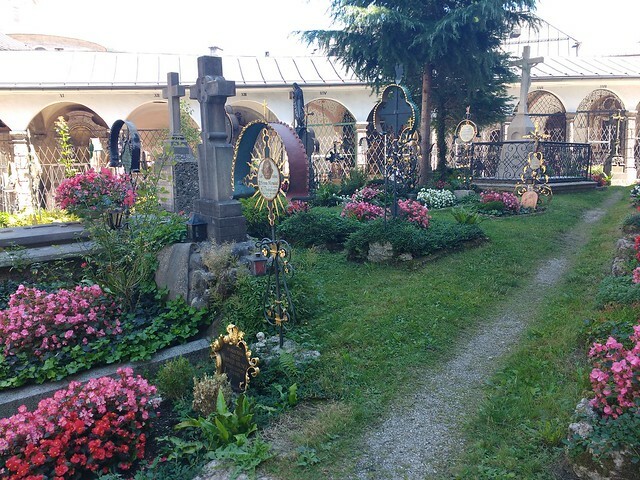 I ended up wandering through a church cemetery that turned out to be absolutely beautiful. Very Bavarian, isn’t it? It’s unlike anything I’d seen before. She also demonstrated a few other words she knew in English, including “cat” and “cheese.” We had a little bit of a short conversation with her limited English and my limited German. It was absolutely freaking adorable, and one of those moments you remember long after the trip is over. Sometimes it’s more about the people than the sightseeing. I wandered around some more until the blisters on my feet grew blisters, and decided that my Keds weren’t cutting it. Knowing that this is the home of Birkenstocks (aka comfy German shoes), I went in search of them. They’re really cheap in this area of the world, but with summer being on, it seems that they were all sold out. 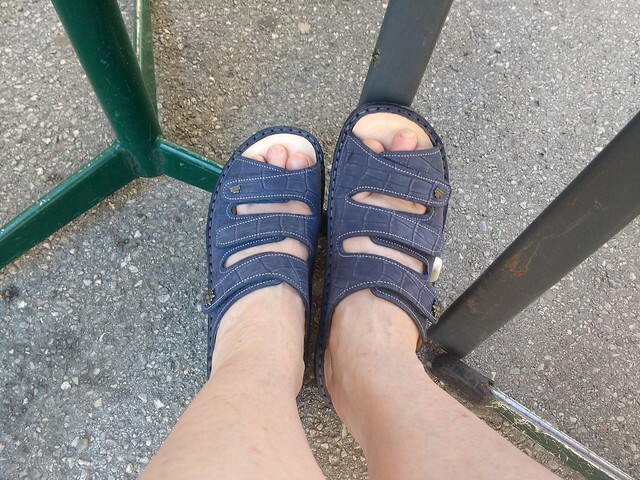 So I spent a lot of money on a cuter pair of sandals that were also a German comfort brand: Finn Comfort. Turns out I paid about half of what these sandals run in the states. And they are COMFORTABLE. They’ll probably be my go to shoe for the rest of my trip. If you know me, you know I hate sandals. But hey, I also hate tank tops and short skirts and this eather has me wearing those, too. A gal has to stay cool. I wandered around a bit more, my toes a little happier, and wandered back to the hotel to pick up my bags and get a taxi to the train station. I bought a sandwich to eat on the train (ham and cheese on a baguette), along with water (and I screwed up and once more got sparkling water, which is growing on me, so I guess that’s okay). And then I munched on a chocolate bar that I was worried would melt in the heat (that’s me, thinking ahead). I came back to my Munich hotel room worried it would be like an oven, but it’s relatively comfortable again. Looks like the Germans really know what they’re doing, huh? Tomorrow, though, I’ve already googled “air conditioned buildings in Munich” to plan my day. I’ll start at a few museums, but the Brandhorst has state of the art air conditioning (powered by solar, so they have no excuses to blast that air like crazy): I plan on staying there awhile.